Now, H5P allows anyone to create advanced and instructionally sound interactive online lessons from within the web browser. Lessons can be downloaded, shared, adapted, and deployed on any device. H5P offers a wide variety of formats: interactive videos, memory games, quizzes, drag-and-drops, timelines and more! See all the examples at H5P.org. These activities can be created directly on H5P.org (just create a free account), though the official line is that H5P.org is “just for testing” content creation (H5P prefers that you pay H5P.com for content hosting, or that you use your own platform to host the software). Personally, my favorite format is Course Presentation. This content type is kind of like an all-in-one – you can create a lesson with multiple slides containing a variety of media, interactive activities, and quizzes. This format is most like the tutorials and courses created with the expensive software Articulate Storyline or Adobe Captivate, if you’re familiar with those. If you’re not, the Course Presentation format is similar to PowerPoint or Google Slides in that it’s slide-based, but you can add advanced interactivity and the learner may navigate the lesson on their own. Are you excited yet about the possibilities of H5P? Keep reading to get the skinny on who’s behind H5P, its open-by-default nature, its technological features including accessibility/508-compliance, and more. Read on below! H5P is an open source project. It’s received a variety of governmental and nonprofit funding, and as of 2017, the Mozilla foundation is a sponsor (1). H5P fills a gap in the elearning ecosystem. Traditionally, interactive lesson-building required expensive software or extensive programming knowledge. Elearning content is typically locked down, limited by both the technology that facilitated its creation, and by copyright. Anything created with proprietary software or hours of dedicated labor is much less likely to be shared freely for others to reuse. This is a shame, since it leads to duplicated content and prevents elearning creators from learning from others’ experience. Content created on H5P is, by default, downloadable and shareable under a Creative Commons license. This feature alone is a huge upgrade from the incredible de facto limitations with content created using propriety software. H5P content is also very advanced in its responsive and accessible features. H5P is not only deployable on any device, it automatically resizes to suit the device’s screen display. Additionally, H5P has an eye on being as accessible (and thus 508-compliant) as possible. Most of the content types are already accessible, and H5P releases continue to improve these features. H5P content types are sorted into four categories: Games, Multimedia, Questions, and Social Media. There are several more content types that don’t fit neatly into these categories, for example, H5P’s Accordion and Column formats, which serve to organize content. Most of the content types are very straightforward. All of the H5P content types are usable for educational purposes. The content type you should choose comes down to your own instructional goal. Are you aiming to create an informational lesson? Maybe an Interactive Video or the Column format would work well for presenting and organizing your content. Do you just want to check your learners’ knowledge? Maybe a Quiz (Question Set) will do the trick, or if you just want a single question, you can choose a Multiple Choice or Single Choice question, among others. Do you want to create an interactive lesson? Go with Course Presentation. As an educator, I’ve used quizzes and Course Presentations the most. A Course Presentation is similar to a PowerPoint. Each slide can contain multimedia or one of a wide range of interactive activities, including all of the various quiz question types. H5P allows you to reuse existing H5P content in a Course Presentation, and vice versa. If you’ve already created a quiz and want to use it in your Course Presentation, you can! If you created a quiz as part of your Course Presentation, you can pull it out as a standalone. H5P content has a variety of up-to-date features appropriate for instruction at every level. For starters, H5P content is responsive. Whether your learners are using it on a desktop, a tablet, or a phone, the content will automatically resize and reflow to fit the screen. It’s all in HTML5 format, too, no Flash! This is especially important because desktop internet browsers are increasingly cracking down on Flash content due to its inherent security risks, and many phones don’t display Flash at all. Many of H5P’s 39 formats are accessible/508-compliant, a feature that is incredibly important. If you are creating content for a publicly funded institution, it’s essential to make your learning materials accessible. If you’re not, it’s still a fantastic feature that makes your learning experience more usable for everyone. H5P features alt-text for images, captions for video, and most content is usable with a screen reader like JAWS. You do have to input the alt-text and captions yourself, and you should always test your content to be sure it will work well for your users. H5P accessibility is constantly being improved, and you can check out the accessibility of each content type over at H5P.org (4). H5P content is downloadable, shareable, and reusable. There are so many “freemium” educational technology services and apps these days, but it’s common to become attached to a particular one and create lots of content with it only to have it shut down or convert to a completely paid system. In contrast, H5P software is open source, as is the content that you create with it. Even if the free H5P.org service is shut down, the software will continue to be available, as well as the plug-ins, allowing you to continue using it even if no one new takes up the standard to continue developing it. H5P is an open source project that subtly encourages content creators to produce open content themselves. By default, all H5P content is licensed with a Creative Commons license, and all H5P content has a download button, which means that an enormous interactive library is available for reuse, revising, remixing, and redistribution. In the United States, content creators automatically hold copyright to their own work, with no need to register with the U.S. Copyright Office or to label their work accordingly. Copyright, at its most simplistic, is exactly what it sounds like – the right to control copies made of the work. H5P content creators automatically hold the copyright to their own work, and they have the right to assign a Creative Commons license to their own work which proactively notifies potential users of how they may or may not reuse it. No matter what kind of Creative Commons license a creator assigns to their work, the creator still retains copyright. All content created at H5P.org is automatically assigned the Creative Commons Attribution 4.0 International (CC BY 4.0) license, unless the content author states otherwise (5). The CC BY 4.0 license is the most open of the Creative Commons licenses. Under this license, anyone may reuse, adapt, and redistribute the work without contacting or notifying the content creator, as long as they provide proper attribution to the content creator. The Download and Embed buttons on H5P are enabled by default, making it simple to make a copy for adaptation – just download the H5P file, then create new content and upload the file. H5P.org allows users to upload H5P content and customize it. Just don’t forget to give proper attribution! Head over to H5P.org to create a free account and get started creating content. Choose your user ID wisely as you won’t be able to change it later on. From your dashboard you can jump into creating content. If you’re using H5P for the first time, I would give the Course Presentation a try since you can include a variety of H5P content types within it. 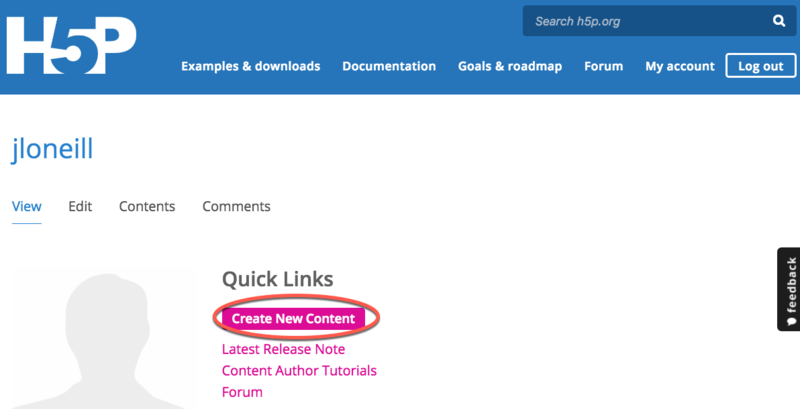 Once you Click Create New Content, you are offered the opportunity to upload an existing H5P file or choose a content type to start creating from scratch. Always start off by giving your new H5P a title, and remember to click Save regularly! If you accidentally navigate away from your H5P as you are working on it, all of your work will be lost. The Save feature is a little clunky – once you save, you’ll have to click Edit to go back into editing mode. Don’t worry about breaking anything as you are creating your first project. You can always use this as a test project, or reuse content later on in future projects. You may also want to try downloading an existing H5P (there lots of examples you can download in H5P’s Examples page! ), and then uploading it and editing it. In the next installment, I walk you through creating a Course Presentation and adding media and interactivity. Have fun playing with H5P! H5P Tutorial – Create Interactives for Your LMS or Website. Video tutorial on YouTube. Tutorials for Authors. Official H5P tutorials for every content type. Svein-Tore on H5P, Episode 47, Dear Instructional Designer podcast. Instructional designer Kristin Anthony interviews Svein-Tore, the founder of H5P. Creating interactive content with H5P, The E-Learning Coach. Connie Malamed interviews Timothy Lim, Core Developer for H5P. H5P. Wikipedia. [Online] November 2, 2018. https://en.wikipedia.org/wiki/H5P. Andriotis, Nikos. Interviewing the founder of H5P, Svein-Tore Griff. efront. [Online] https://www.efrontlearning.com/blog/2017/10/interview-svein-tore-with-h5p-ceo.html. H5P. December 2017 status update. H5P. [Online] December 19, 2017. [Cited: May 30, 2018.] https://h5p.org/dec-2017-status-update. —. Content Type Accessibility. H5P. [Online] [Cited: December 11, 2018.] https://h5p.org/documentation/installation/content-type-accessibility. —. Licensing. H5P. [Online] [Cited: May 30, 2018.] https://h5p.org/licensing.